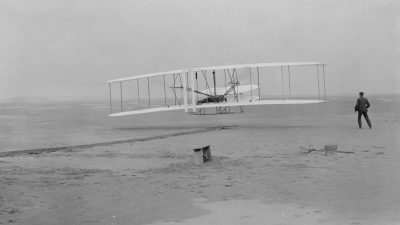 The 114th Commemoration of the First Flight- Sunday, December 17, 2017. Location: The Tent south of the Wright Brothers National Memorial Visitor Center (closed for renovation). All fees are waived for the day. Park Hours 8:00-5:00 pm. The temporary visitor center/gift shop opens 9:00 am. 8:45 a.m. – The formal program will be opened by Arthur Lamothe, President of the First Flight Society. The Civil Air Patrol, NC and VA Wings, will present the colors. The Northeast Academy for Aerospace and Advanced Technology will lead the pledge of allegiance. Graham Outten will lead the National Anthem. NPS Superintendent David Hallac delivers the official Welcome. Dr. Tom Crouch, Smithsonian Institution Senior Curator of Aeronautics, will induct Elrey Borge Jeppesen into the First Flight Society’s Paul E. Garber’s First Flight Shrine. Elrey Borge Jeppesen is an aviation pioneer whose “little black book” of notes and hand-drawn diagrams grew into the Jeppesen Airway Manual, which is known and trusted by pilots all over the world. Darrell Collins, NPS-WBNM Historian (Retired), will share the Wright Brothers story and preside over the wreath-laying ceremony which is conducted by descendants of the witnesses of the first flight to honor the Wright brothers. The base of the monument will be open for visitors to walk through with Park Volunteers sharing historical remants of the monument and the Wright story. The Outer Banks Repeaters Association (Ham Radio) will be on the east side of the monument road (Loop Road) sharing the event with HAMS world-wide. Park rangers will provide 15-25 minute interpretive talks on the park grounds at 1:00 p.m., 2:00 p.m., 3:00 p.m., and 4:00 p.m. Youth are invited to participate in the park’s free Junior Ranger program available throughout the day at the temporary visitor center. Aviation enthusiasts can experience the event live via Facebook stream on the Wright Brothers National Memorial page. The commemoration is organized and conducted by the First Flight Society and National Park Service.